When you look back at their collective output from the late ‘80s and early ‘90s, Toad The Wet Sprocket turned out an extremely consistent set of albums during their initial run which wrapped up when they decided to disband in 1998 and pursue solo interests. After the alternative rock group regrouped in 2002 for a successful reunion tour, they would work cautiously to rekindle the original magic that they once had together as a band. Hearing the group perform on stage, it was very evident that the musical stardust was still there in the songs, but it would take some time behind the scenes before the members themselves felt comfortable again. 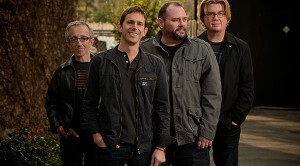 No doubt, a new album from Toad The Wet Sprocket is something that has been on the wish list for many a fan in the years that the band has been back in action. After taking a few baby steps in the studio (including recording an album’s worth of new versions of their own classic songs), Toad finally delivered the gift of a new album with the release of New Constellation this past fall. Non-believers and naysayers had to step aside—the first new album from Toad The Wet Sprocket in 16 years was, without question, a fully triumphant moment that sideswiped any odds that might have been stacked against it. The band has been on the road promoting the new release and they just recently announced a fresh slate of tour dates for 2014 as well as a contest to create a video for their new single, “The Moment.” We caught up with Toad frontman Glen Phillips during a brief moment at home in the garage for a phone conversation. There has been great response to the Toad reunion, which obviously has been in effect for a number of years at this point. But the initial response to the Kickstarter that you used to help fund this new album and how quickly it was funded seems like it really caught you all by surprise. Yeah, the response all around has been pretty incredible between the Kickstarter thing and the response to the record, it’s been very great to see how positive everybody’s feeling. You guys took advantage of something that I think a lot of bands and artists should do more of and that is taking the chance to play some of these new songs live as you were in the midst of recording the album. Did that help to morph and shape some of this material in addition to the obvious opportunity to road test this stuff for fans? Yeah, it did. We had to be judicious about it. We’re in a strange era in that it used to be that you could really test stuff out live and it wouldn’t be everywhere. We wanted to make sure that we were able to work some of these out but also that when you get the record, you would actually get to unwrap a little gift and hear something new. [Laughs] So we kept a fair amount of it under wraps for a while. I think any song that we did tour with benefited greatly from it. We didn’t have that luxury with all of the material, but some stuff is more studio-oriented anyway. “Friendly Fire” was one of those songs and it’s on the Kickstarter version, but ultimately didn’t make the final album. Listening to the way this album lays out from a sequencing perspective, it seems like there might have been some tough decisions as far as what to leave in and what to take out. There were. “Friendly Fire” in particular actually was just one of those ones that as we worked on it, we just didn’t feel like we’d nailed it. The best performances of that live had a great vibe to them and we didn’t really get it on the recording. That’s why that one ended up not being on the record. You’ve got a firm grasp on how much the industry has changed since the last time you guys made an album and today, tomorrow or last month, it continues to change. With that in mind, how did that affect your approach to the idea of making a new Toad the Wet Sprocket album. Were you always thinking in terms of doing an album? We’d started playing more shows live. You know, we would try playing a few shows and it would get weird again and we’d stop. At some point, it wasn’t getting weird and once it wasn’t getting weird, it was kind of the next logical step. Because we’re out there playing these shows and we added a couple of new songs in and whenever we did that, we felt like a band again. You know, playing a bunch of 20-year old songs is all well and good but we’re not done as writers and we’re not done as musicians. It finally just felt like the next logical maneuver was to give ourselves a bunch of [new] songs to play so we’d have a better time. I think we all had the idea that we wanted it to be an album that would be fun to listen to and buoyant. We were not always what you would call a buoyant band. That’s one thing that I got from listening to this record is that it seems like you came away with a really good bunch of songs that are going to be fun to play live. I actually had the chance to see you guys play a show earlier this year in Columbus with Don Felder and the new stuff goes over really well. Yeah, it’s good. I think we all had the idea that we wanted it to be an album that would be fun to listen to and buoyant. We were not always what you would call a buoyant band. [Laughs] We had kind of simple pop songs, but often with fairly heavy lyrics. It’s not like there’s no darkness on [this album], but for me in my 40s, I spend a lot of time navel gazing and worrying and I’ve found that I need to actively take myself out of that state—deactivate myself and choose optimism. So a lot of those songs I think are about that process and there’s a positivity to them that wasn’t necessarily in the old stuff. And also, [it’s about] all of us realizing that Toad was a broader band and so I am often a little more obscure in my solo stuff and geekier and stranger. I knew that coming into Toad, this wasn’t the place for my weird stuff, this was the place for stuff that felt more instantly familiar and stuff that was more within a wheelhouse of writing that’s much more straightforward. Would a song like “Rise Up” from your solo career be too far to the other end of the dial from where you wanted to be on this record? Maybe. You know, probably the closest to that [from the sessions for this album] was the song “Last To Fall,” which was much more sophisticated as far as the chords, very obscure as far as the lyrics and maybe more poetic and less direct and that didn’t make the cut at the end of the day. [Laughs] Once again, it’s more like the stuff I’ve tended to do in my folky solo world, although “Rise Up” is a great song. I’m very proud of that one. I always wish that more people would have heard it. That particular song sticks out in recent years as a good example of how your work can really go to an interesting place. There’s an almost childlike contemplative feel to that one, but there’s also a lot of atmosphere and different things going on, which I think tends to be the case with a lot of your songs. Each song can take people to different places depending on their frame of mind. I tend to like songs that can be adapted, if that makes sense. If a song is too straightforward and too locked in a particular narrative, time and place and everything else, then it doesn’t mean as much for me a year later. It’s funny like when people want to know what a song is about and if they’re right or if they’re wrong. It’s like, “Well, did it do it for you?” If it does it for you, it doesn’t matter why I wrote it. It’s always a little disappointing to hear [where a song came from]. I remember that when my dad passed away, I met Randy Newman. He played some show in town and I was lucky enough to get to go backstage and fawn all over him. Because I had the Sail Away album and the song “Old Man,” I just played it over and over after my dad died. That was like my song for that. And I said, “I just need to know, ‘Old Man,’ where did that come from? What made you write it?” He’s like, “Oh, you know the end of 2001 where he goes into the obelisk and he’s young and he’s old and it’s all like freaky lights and stuff?” [Laughs] What I got out of it and what he put into it were two entirely different things. But he wrote it in an open enough way that it did that for me.
. . . there’s no song that’s going to lay out all of the ills and goods of the world and explain what it means to be human. But you can hopefully explain one feeling and all of the contradictions within that feeling. I think it’s interesting too though that you can have an album like that and maybe you’ve had it in your collection for years, but you have an event like that which really brings out a song or songs or maybe the entire album in a way that you never heard it before. It’s what I aspire to as a writer, that experience and to provide stuff that’s about . . . Well, you know, there’s no song that’s going to lay out all of the ills and goods of the world and explain what it means to be human. But you can hopefully explain one feeling and all of the contradictions within that feeling. Because they are complex things — they have a lot of texture and flavor and smell. If you can get enough of that in that it feels authentic then I think you’ll reach people at a moment in their life where they’re having that set of feelings, regardless of the precise circumstance that brought them there. That’s what I hope I can bring to people and I hope that’s why people have stuck with Toad is that we struck a few of those chords for them the first time around. Hopefully they trust us to give them something that still feels true at this point. Songwriting-wise, are there things that you have to work not to get hung up on? Looking at what we’ve been talking about, for example, do you look to keep things general and not go too far inside? It really depends. Some stuff is very narrative. This Toad album I ended up keeping very personal in tone. I thought that was right for the band. I tried to keep the tone up, not that every song on it is happy. Once again [we’re] at this age where our generation has seen a lot of their hopes and expectations, you know, the social contract basically, being broken. [It’s] a point at which doing your best and working as hard as you can and doing your part of that equation doesn’t guarantee you a whole lot anymore. So to make something useful out of that shared experience, you can take the lesson that we’re all screwed, which is probably true, but it may not be the most helpful lesson. Or you can take the lesson that you’re responsible for your own happiness. It’s not something that’s going to be given to you if you do your job—it’s a practice and it’s something we need to claim internally and claim with the people we love the most and who are closest to us, to kind of reinvest our faith in the people right around us. I think a lot of the album is about that [effort to] refocus, a loss of faith and trying to restructure something that’s a little closer to home. Our manager loves saying, “Control your controllables!” [Laughs] It’s how you treat the people right next to you, because everything else these days is pretty up for grabs. “I’ll Bet On You” of anything on the record is the one that’s really on the nose. That was a song that musically Todd had in his band Lapdog. He brought it in and wanted to kind of “Toadify” it. I had a bunch of friends in New York, [including] a few people who lost their homes during [Hurricane] Sandy. And in Santa Barbara, it’s been a while now, but we had some massive, massive fires. My wife and I were counting, we knew like 40 people who had lost their houses or had major damage. It really upended our community in a fairly major way. Once again, in both instances, the thing that I kept seeing for all of the horror stories was how much people showed up for each other. People in New York kept talking about [things like] the one pizza shop. There’s the one pizza shop that starts charging 100 dollars for pizza and guarding themselves with guns and then there’s the other one that goes, “Well, this food is going to be bad and we should feed everybody before it all goes bad.” The places just opened their doors and fed entire neighborhoods. Over and over, when it came down to a dire situation, that’s when all kinds of little heroism kind of popped up. Of any song on the album that’s kind of a straightforward anthem, that would be the one. Jonathan Kingham seems like he’s become an important presence in both your solo world and on the Toad side of things in recent years. I know you guys wrote “Golden Age” together for this record. That one he just kind of left at my house. He was staying over one night and he woke up and I was making something for breakfast and he started playing that main riff. I was like, “What is that?” He said, “I don’t know, I’m just making it up.” I asked, “Can I have it?” He said, “Sure!” So he went back on tour and I wrote two or three different attempts at songs around it and finally came up with that. I just loved that riff so much I had to make something out of it. It wasn’t really like sitting down in a room and working it all out, it was much more that he gave me that little gift and I just took it where I could. How did he come into your world? I met him through our mutual friend Steve Smith–he used to be my manager and he lives in Chicago now and works for AWARE Records. At a songwriting conference, he introduced me to Jonathan and we just hit it off right away, you know, he’s one of those people you meet and it seems like you’ve always known them. From seeing his spot-on cover of Bobby Brown’s “Every Little Step,” it seems like has a good sense of humor. He’s got a great sense of humor and he’s got a great sense of calm and I’m a person who can go pretty dark. That’s the other thing that a lot of these songs, as happy as the choruses may be, my brain tries really hard to make me destroy myself. [Laughs] Once again, the thing I keep coming back to is the idea of happiness as a practice. I feel like in the last two years, my day to day experience is probably what people would think of as normal internally. I’d taken the happy drugs way back when they were handing out SSRIs to everybody and those didn’t really work on me. The stuff that works for me [are things like] exercise, being around happy people and working hard at interesting stuff. That’s what seems to make life work and [it’s important for me to treat] happiness not in terms of getting what I want, but [instead] in terms of almost hygiene. [It’s like] looking after the stuff that matters every day and understanding that if I start to crack at the edges, it may be one of those things that I haven’t looked at properly. Why am I talking about this in the context of Jon? He’s really good mental hygiene for me, being around him. He doesn’t go too dark and he can handle a lot of stress and he can keep a really great attitude. I’ve found that being around him makes me a happier person. So I try to have him be a part of as many situations as I can. Todd and Dean had been writing together and since Toad broke up; they really became a writing team. So they brought in a bunch of things that they thought would be right for Toad and kind of let me have a crack at rewriting them. Their original demo had some words and the one thing that stuck out to me was the title “California Wasted.” As a person who has woken up on a lot of sunny days and kind of closed the blinds and stayed inside, it struck me as the perfect image. Once again, your mood is an internal thing—it’s not about what’s externally happening. One of the worst tricks I think that depression plays on you is the guilt [it gives you] about that fact. It doesn’t mean that you don’t see how great everything is outside, but you still can’t get yourself out of that mood which often makes it worse. If you’re very aware that everything around you is great and you’re still making it crappy, that can just make you feel guiltier for it. That song is a little bit hopeful, but it’s probably the most on the nose as far as the depression side of things. Still, hopefully it has enough awareness in it that there is all of this light outside and that the only thing keeping you down is yourself. Or in my case, the only thing keeping me down is myself—I’ll own that one. I love the tension in that chorus melody, which I have no responsibility for. The phrase “California Wasted” was great and I tried for a while to rewrite it, because I thought if you’re going to have California in the title of the song, it shouldn’t be a bummer! [Laughs] But I finally gave up. How much writing did you do for this record and how much of it besides the stuff that we’ve talked about was stuff that was hanging around? It was really varied. There were a few songs that were written very distinctly for the band, “California Wasted,” “Is There Anyone Out There” and when I sat down and started writing, I was doing things like “New Constellation,” which was very much for the band. You know, writing rock songs, I don’t do a whole lot of on my own, because I’m always getting ready to go out [and tour] solo acoustic. “New Constellation” and “Get What You Want,” those were definitely written very distinctly for Toad. Other songs were brought in and adapted. “The Eye” was something that I wrote during that period that I thought could work, but the original demo I made for that was much more synth-y. It had no guitars in it at all and I kind of had to bring that in and give it to the band to rework, but I knew it would hold up with that treatment. You spoke earlier about the weirdness of playing gigs that would come at the end of certain runs. How did you guys get past that? I don’t know. It’s all still a work in progress. Bands are just weird. [Laughs] We had a lot of history and certain stuff just takes time. I’m sure there were times when everybody else in the band was feeling good about it and I was still psycho and I know there were times where I would come in feeling really optimistic and stuff would come from other corners that would make it hard. We all had to actually be on the same page again. There was a lot to overcome–interpersonal stuff and the damage that happens when the very first thing you ever do is successful. It creates really bad expectations about how life works. Or at least very unrealistic expectations about how works, because Toad went out and everything just kind of happened for us. We worked hard, but we really couldn’t help but take it for granted to a degree and take each other for granted. To get back together and really need to appreciate each other and need to show up for each other, I think it made a huge difference. Because there was a long period where I think we were all just kind of in our own corner and not coming together. We’re not a band that hangs out on our days off all of the time together. To realize that we have a creative relationship and it doesn’t mean we also need to need each other in every other way. To kind of understand what our limitations are and I think that’s stuff that for a band that hadn’t gotten together as early as we did, it might have been a little bit easier. But we started playing together when I was a freshman in high school and they were all seniors. Todd and Randy had known each other since they were five and they met Dean in junior high, so these are not new relationships. We didn’t get together as adults and choose each other. [Laughs] There’s just a lot to process and it’s been a lot better since. Yeah well, it did. I am really grateful for the years since Toad. I learned a lot. I mean, to go from being in a platinum-selling band to selling 500 copies on Bandcamp and not even bothering to press CDs. Going out on the road, booking my travel, doing my tour managing, my website—I was a one-man show for a very long time and it got very, very small. I can still support my family on that, but I’ve had a chance to do every job and do most of them badly. So when I go back out with Toad now and we have a guitar tech, I think I’m the luckiest person on the face of the earth. I know every job that’s getting done, because once again, I haven’t done them all well, but I’ve done them all. The idea that we have an audience waiting for us and that we have a crew, like we have a sound guy—it’s frickin’ amazing. So I can come back to Toad and rather than resent how different it is from how it used to be, and I know I’ve done that in the past, right now I can be really, really grateful for what it is. Unless I’d had the experiences I’ve had in the last few years of my career, I mean, there were years where I was so depressed and I should have stayed home and I went on the road and stood in front of audiences who could just tell I didn’t want to be there. There’s nothing worse than paying a ticket who doesn’t want to be there, you know? [Laughs] So hitting bottom a couple of times helped me get a little gratitude and not take it for granted and realize I’m not owed anything. The fact that anybody wants to see me play my songs and the fact that anyone will show up to do that is remarkable and is something I need to keep remembering is great. [Laughs] So for me, that is what has let me come back to Toad is I’ve been able to compare a lot and I know we’re very lucky. I keep that in mind every day I’m out there with the band. Great honesty from one of the good guys. I’ve been following Toad & Glen since I was a senior in high school (1990) and am so thankful Glen has continued to share his music with the world through the ups and downs. I saw them twice on this recent tour and they’ve never sounded better or looked like they were having so much fun. Got to speak briefly with Glen and get a picture on their last stop in Seattle and it was such an honor. Looking forward to the next 25 years of Toad & Glen!